It’s my pleasure to offer a custom cover series to one of my all-time favourite scores. 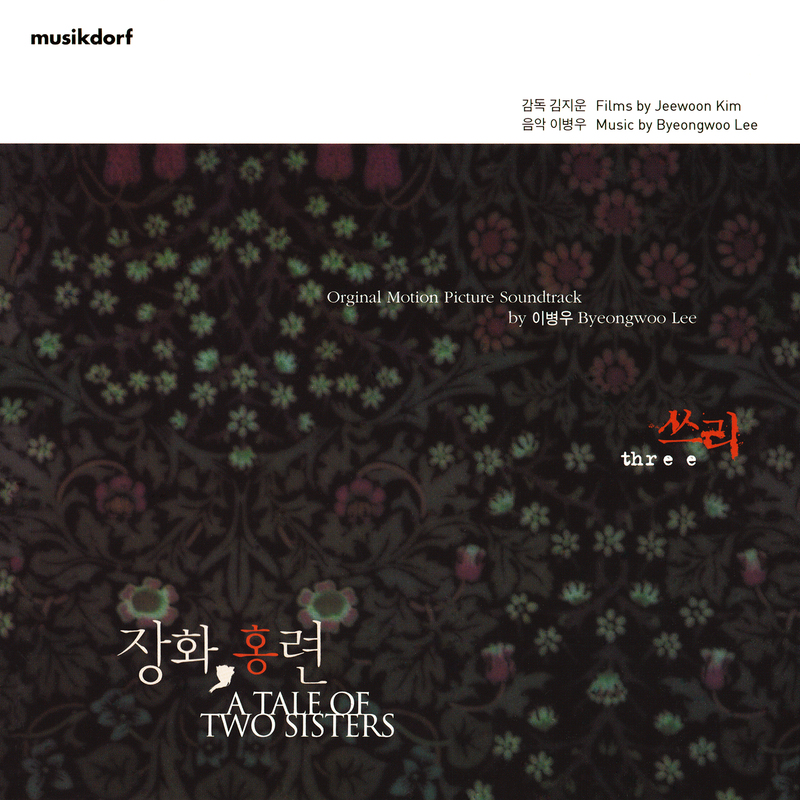 Byeongwoo Lee’s A Tale of Two Sisters. It is widely regarded as one of the finest horror scores ever written. And it is indeed, let me tell you that. Christopher Young, designated master of horror, came up with a very good score for the US remake as well, but Lee’s original is surpassing it in every way. The composer himself published the score on his own label musikdorf in 2004, coupling it with his other effort for the films director Jeewoon Kim, the score for Memories, a short segment of the anthology film Three. The original artwork (#1) actually had a typo on the front cover! I’ve only discovered it now, ten years after I’ve originally bought the soundtrack. This of course brings up the question whether other words are misspelled as well – above all the name of the composer, naturally. According to Wikipedia, his name is Byung-woo Lee. Nevertheless I decided to keep the albums notation, if only for the sake of consistency. And I’ve also corrected the type error and edited out the Three logo, because I’d like to see that as a stand-alone release. So, in case you’re interested in the original artwork including the logo to Jeewoon Kim’s short film, here it is in full glory. Following the original is a series of DVD and Blu-Ray based customs (#2 to #5). The film was released on numerous labels in various forms (Steelbooks, Digipacks, 2-Disc Editions,…), a concession to the quality and significance of the film, especially on the Asian market. It wasn’t easy to track down high resolution versions of these images, given to the fact, that the film isn’t that popular in western hemispheres (for some inexplicable reason). But the internet folk is a helpful one. And through the kindness of some foreign-language film-fans I got hold of every necessary image. Especially film-blogger Steven Trotter and Hi-Def Ninja member “nekromantik” went to great lenghts for me… so thank you very much! My other three designs (#6 to #8) are entirely self-created whereof the middle one (#7) had a quite funny origin story. First you have to know that A Tale of Two Sisters is a Korean fairy tale originally entitled “Janghwa Hongryeon jeon” and during my research I once stumbled upon a the cover of a book adaptation. I couldn’t read anything on the website at all and only saw this tiny little, pixelated thumbnail, but it sparked my immediate attention. And it ultimately led me to make my own high definition version of it. The digital booklet below is loosely based on my original CD booklet. This one wasn’t the piece of cake I expected it to be, which is mainly due to the numerous names and terms in Korean language, which I – because I’d like to have my digital booklets searchable – had to retype using appropriate fonts (“BatangChe” and “Dotum“) and extensive use of bing’s online translator. And because I divided the original soundtrack into two separate albums, I’ve also made a front cover for Lee’s score to Memories. I wish I could find a copy of this soundtrack, I’ve been looking for years… what it needs is a vinyl reissue. You know what? Despite coming up with all those Vinyl covers, I don’t own a single one for real. Listening to Vinyl records is a treat I still have yet to indulge. I never stopped loving vinyl since I was a kid… the convenience of CDs never made me want to give up my records… I just couldn’t afford or have the space until maybe 10 years ago… so I watched the resurgence of vinyl happen slowly over many years, while most think it just happened in 2014… it was a slow boil….